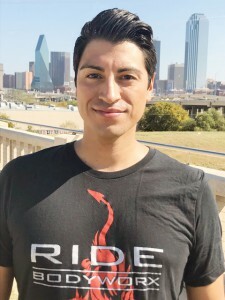 08.12.2017 | Dallas, Texas, USA – Sliquid, LLC, leader in the cleanest, safest, simplest intimate products on the market, proudly announces Erik Vasquez as the new Brand Ambassador for their male-focused product line, Ride BodyWorx. A native Dallasite, Erik is a well-established member of the LGBTQ community with invaluable connections both domestically and abroad. “When meeting Erik for the first time, I saw a bold, engaging personality that I believe will work to our advantage as we relaunch RIDE to the marketplace,” says Dean Elliott, Founder, and CEO of Sliquid, LLC. The current Ride BodyWorx line consists of three high performance product categories including lubricant, male enhancement products, and intimate shave creams. With direction from the VP of Sales and Marketing, Erik is responsible for the creation and implementation of marketing and sales strategies focused on heightening the visibility of the entire Ride BodyWorx product line. Erik is joining the Siquid team after a two-decade career in customer service and administrative positions. His ability to handle both operational tasks, as well as engage with Sliquid consumers, buyers and vendors alike, allows him to also play a supportive role to the Sliquid Operations Liaison and Senior VP. Of his new position with Sliquid, Erik says, “I feel privileged to be joining such a reputable company whose image is synonymous with the highest quality of lubricant. For someone that is new to the industry, having the Sliquid namesake as a foundation will be paramount when beginning my endeavor to reposition RIDE BodyWorx to a recognized leader of men’s sexual health products.” At home, Erik shares his life with his partner James Hall and as Vice President of the Dallas chapter of a global non-profit, Erik uses his free time to bring HIV/AIDS awareness and sexual health education to the most at risk members of his community. For more information about Ride BodyWorx or Sliquid, please visit www.ridelube.com and www.sliquid.com.